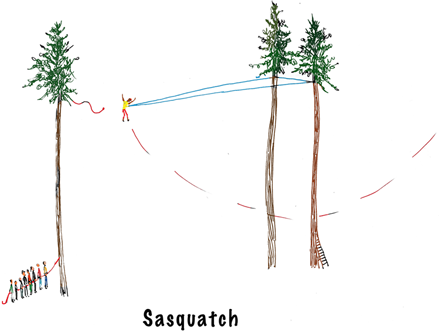 The Sasquatch is the same as the Giant Swing except larger. The participant climbs up a ladder and is attached to three cables suspended from two trees. A releasable rope goes from the participant up to a pulley in a separate tree and then back down to another pulley at the bottom of that tree. After the ladder is removed and listening to the participant the group pulls on the rope coming from the pulleys and pulls them up until they are as high as they want to be (up to 65 feet). When they are ready they pull a string and are released into momentary free fall and then a giant swing. This is one of the most exhilarating elements and is perfect for larger groups.